- from Diamonds Are A Girl’s Best Friend by Jule Styme and Leo Robin. Sung by Marilyn Monroe. 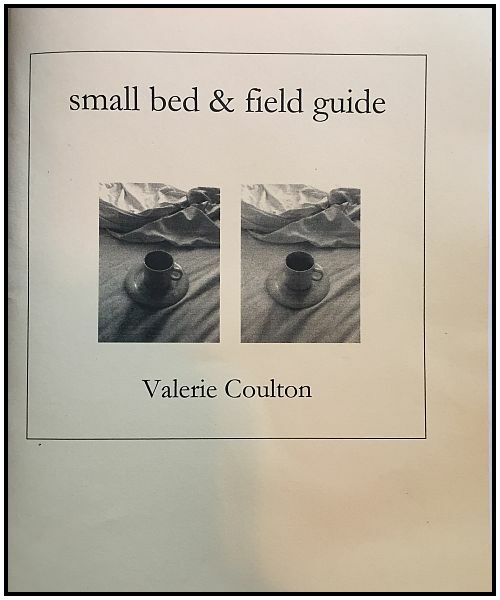 small bed & field guide is a rhythmic offering in the ontological, a Beat poetry tradition progression that rails and falls by Valerie Coulton and above/ground press. Valerie Coulton lives in Barcelona and has written 3 books of poetry published by Apogee Press. She has co-authored lirio and anonymous (published by Dancing Girl Press) with her Poet husband Edward Smallfield. The long poem is a series of short blunt lines in fantastical, that fall to the ground as if not expecting to take root, as if in trepidation. The blunt stilted rhythm reminds This Writer of a tedious crossing of long time. The words in images hang in the air in a subtle violence, a quiet liturgy of plaint, dark imagery weaving. The disjointed thought train is mystery, that builds a hidden story of all is not well, an allusion to cultural mishap, love life mishap. It is as if someone was expected to apologize for not being blonde. jewels for sweetness: day closes over. Go into sea’s bed and sleep"
The broken images roll out, sometimes allusions to broken love affairs, considered in layered pictures of nature, the home and the machine. It is an inside story of as the day passes, a truthtelling. Images of the weather, sky, trees, butterflies, on the homefront food, language are expertly woven with photos, the auto, the machine. The image created is often fatastical with DaDa influences, often surreal. An original brilliant work in the magic of New Age poetry shine, small bed & field guide by Valerie Coulton.